Just how tough is it to win a Test series in Sri Lanka and what does it take? England haven't achieved the feat in their most recent three visits, last emerging victorious in 2000/01 when Nasser Hussain led the tourists to a remarkable come-from-behind success. Back then England arrived in Sri Lanka buoyed by a remarkable 1-0 series win over Pakistan - their first in the country in 39 years - sealed in the Karachi gloom, but quickly found themselves behind. We got absolutely hammered in Galle off the back of Marvan Attapattu's double-hundred in a Test that proved that, in this part of the world in particular, the game is won or lost in the first innings. I'd always felt watching previous England tours that you need to keep control in the field and try to stay level or slightly ahead; England simply can't afford to find themselves 100 runs behind and up against spinners who are ragging the ball square with men around the bat, because then they'll be fighting a losing battle. So all eyes will be on Root and his decision-making, especially regarding when to attack and when to defend. If England can stay level on first innings or even eke out a lead, the pressure will build on Sri Lanka; England may be relatively toothless away from home on flat pitches, but when it turns Moeen Ali, Adil Rashid and Jack Leach come right into the equation. After losing at Galle we went back to the Lighthouse Hotel to sort ourselves out. Darren Gough ordered some beers and we sat around the pool discussing into the dark hours how to improve. Don't miss a ball as England bid to add Test success to their ODI and T20 victories. As a batsman you have to accept that during the first 10-20 minutes of your innings, survival is going to feel nigh-on impossible. But after half-an-hour everything gets so much easier - you start picking up the variations and length and then you're in. So you have to come up with a survival method, whether it's in an attacking style like Kevin Pietersen favoured or a more defensive one that someone like Alastair Cook utilised so expertly. Sri Lanka was the hottest and most humid place that I've ever played cricket - and consequently one of the hardest places to win. You're virtually dripping with sweat before you take the field, you must continually hydrate and these outfields, because of all the rain, will be very heavy. If you spend a day in the field you will know about it. On my tour we had one of the great players of spin in Graham Thorpe, who was brilliant at keeping Muttiah Muralitharan at bay. 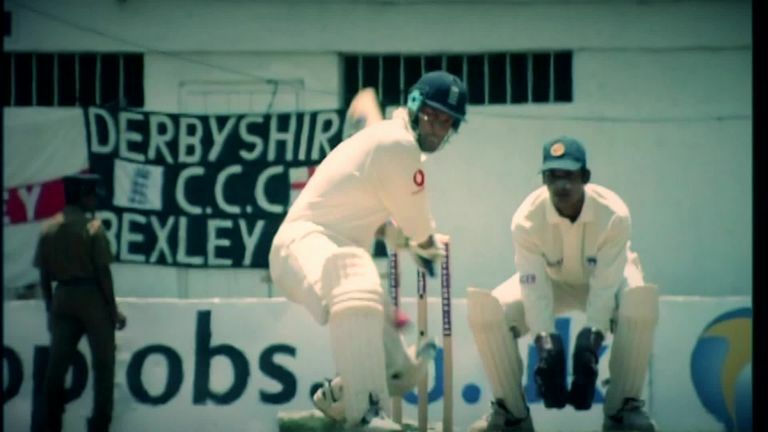 He nailed the balance between attack and defence - something he illustrates in a demo you can watch here - and that inspired the rest of the team, just as Gough did with the ball and Mike Atherton had done in Pakistan. My first-innings hundred - during which it's more than fair to say I rode my luck - was the most difficult of my career and so one of the most satisfying. Back then we assumed that Murali would take five wickets an innings - it seemed inevitable as he was going to bowl at one end all day. The key was to make sure that he bowled 50 overs to get his five-for and not 20 overs. Similarly, this England team need a couple of batsmen to stand up and show that it is possible to counter Sri Lanka's attack on these pitches; succeed and confidence should spread through the team like a good virus - other players will start thinking 'we can do this'. We wouldn't have won in 2001 if it wasn't for Thorpe's batting - no-one got close to his unbeaten 113 in the first innings, or his 32no in the second for that matter! Earlier this summer Shaun Pollock Whatsapp'd me during a discussion on Sky Sports Cricket about who should go on this tour and wrote 'don't worry about what batsmen have done in England or where they bat, just pick your best seven players of spin'. It's a theory I buy in to, but you mustn't forget your seamers either because they have a huge role to play. On my tour Andrew Caddick and Gough in particular, with his low, skiddy reverse swing, played a massive role. Gough was as effective as any of our spinners on that tour and was rightly man of the series after following up his eight wickets at Kandy with another five here. We knew Murali could turn it on glass so I didn't want to play on flat pitches so I could bring Ashley Giles and Robert Croft into play, and so it transpired in Colombo as our spinners put us in control. In general back then the pitches were very good for the first couple of days and then it would turn square; now Sri Lanka have used their home advantage tell to make it spin from ball one so Moeen, Rashid and Leach can expect to be right in the game early on - providing all the rain hasn't had too much of an impact. So can England emulate the success story of 2001? Conditions are different these days and Sri Lanka aren't the side now that they used to be - in the era that I played in they had six greats of Sri Lanka cricket in their team in Sanath Jayasuriya, Kumar Sangakkara, Mahela Jayawardene, Aravinda de Silva, Chaminda Vaas and Murali. Coming from behind to beat a side featuring those players on their own patch after a mauling in Galle was extraordinary and, coupled to the victory in Pakistan, made it the most satisfying winter of my career. It was a hugely controversial series; there were a lot of decisions that went our way and some that went against us. Not to put too fine a point on it, there was some unbelievable umpiring but the cricket was also very, very watchable. Cricket is a team game but two individuals, in particular, stood up on that tour and now England need a couple of players to set the standard, just as Thorpe and Gough did. We also caught very well around the bat on that tour to our spinners and that will be another vital facet. This series will be a real test of Root's captaincy - not least because it will be a complete contrast to facing India this summer when the Dukes ball was still moving around after 70 overs! England's record away from home has been very poor but I still believe that they have a good opportunity to put that to bed if they have the right mindset and game-plans. Watch the first Test between England and Sri Lanka live on Sky Sports Cricket.